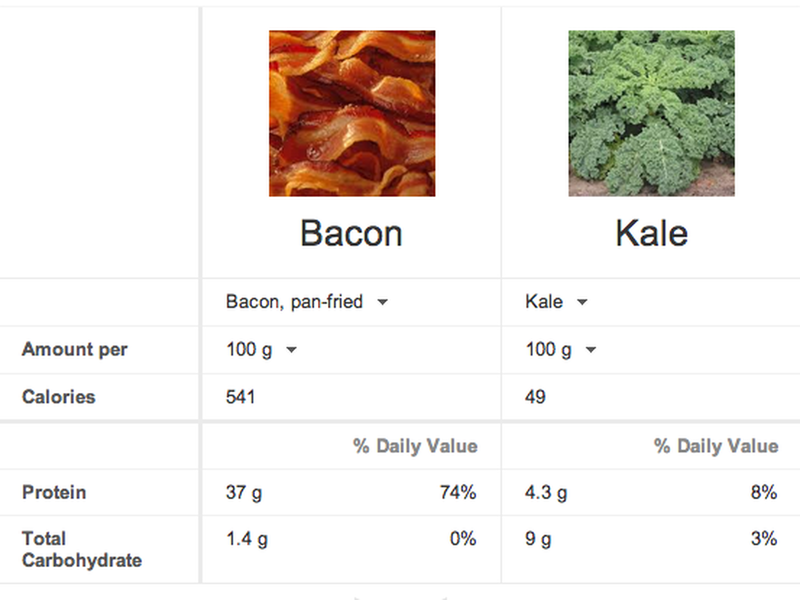 Google Tool Compares Nutrient Content of Foods. 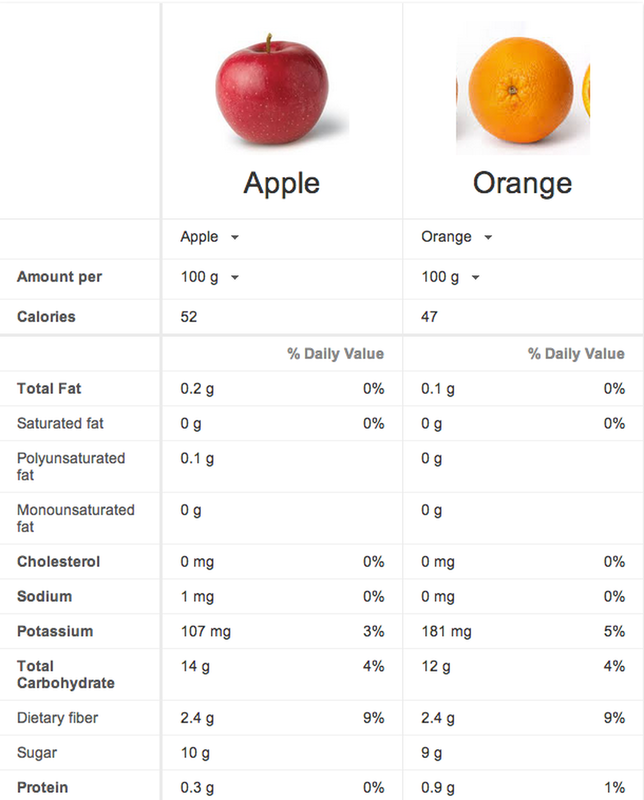 Apples Vs. Oranges: Google Tool Offers Ultimate Nutrition Smackdown. Recently, Google’s nutrition comparison tool was quietly launched at the end of 2013. Using this clever little tool is as simple as searching for two types of food, preceded by the word “compare.” The word “vs.” between the two foods also seems to work for some comparisons but not every single one. For example, say you want to compare the calories, sugar content and nutrients of mashed potatoes and sweet potatoes? Just type in “compare mashed potatoes and sweet potatoes,” and boom, you get photos and an elegant chart revealing that sweet potatoes have 4.2 grams of sugar per 100 grams, compared with 0.5 grams in mashed potatoes. Scroll down and you’ll see that sweet potatoes kill mashed potatoes in vitamin A, potassium and calcium content. As you contrast ingredients, perhaps out of sheer curiosity, perhaps to design a meal plan, you’ll learn a lot by playing around with the preparation and cooking method of the food. Tweak the mashed potatoes to “potato, mashed, with milk and butter,” and unsurprisingly, the fat content jumps up. You can even compare apples and oranges (apples are slightly sweeter and have slightly more calories, in case you were wondering). Or analyze foods from totally different food groups — for instance, what do grapes and bacon have in common? Google says it’s getting most of its data from the U.S. Department of Agriculture’s National Nutrient Database, so you can compare pretty much anything in it. According to Google, the company created the comparison tool after the success of its original nutrition search tool, introduce in May 2013. Google noticed that people were doing a lot of food and nutrition searches — multi-step searches on one food and another food. These things are often compared to one another, so we thought, why don’t we make it easy? The data aren’t perfect — as discovered when researching deep into bacon. Depending on the preparation you choose, the number of protein grams fluctuates pretty dramatically, dropping all the way to 0.1 grams for “cooked bacon.” (Some have posited that “cooked bacon” in this case means bacon grease, but it’s not clear.) Still, you may still learn some surprising facts. For instance, when it comes to “bacon vs. ham,” bacon comes out way fattier than almost all cuts of ham. The company rolled out yet another food search tool at the end of February: This one helps you access restaurant menus faster — so you don’t have to mess with all those Flash presentations and slideshows that can make it frustrating to scan a Thai menu for your favorite duck curry on your smartphone. Google says it has access to the menus of 75 percent of restaurants in the U.S.
And the food tools won’t stop there. There are plenty more complicated food, recipe and nutrition questions to help people answer. Google wants to give as many answers to as many complicated questions as possible. Could Recession-Fueled Eating-At-Home Trends Be Leveling Off? It looks like Americans’ love affair with eating at home is leveling off, according to new data, a market research firm that tracks eating trends. About 80% of meals were prepared at home in November 2013, about the same as 2012, data shows. The percentage of meals prepared at home has risen steadily from 77.4% in 2008 at the beginning of the recession. The move back home for our meals looks to be over. I’m sure restaurants are happy to hear this. Many people experienced a drop in income during the recession, and people lower their food costs by using restaurants less, because restaurant meals cost three times more than meals made at home. Most cook a lot, but don’t want to do it any more than they already doing. They want to do it less. About 65% of women prepare at least one meal a day at home. It could be for themselves or their families. About 39% of all men will prepare at least one meal at home. That could be me putting a Pop-Tart in the toaster. We also expect people will start dining out more as the weather improves this spring. It has been a horrible winter weather-wise, and that’s not good for restaurants. GOURMET GRILLED CHEESE IS HEATING UP AROUND THE U.S.
Is This Humble Dish The Next Gourmet Pizza? Once, only Italian grandmas made pizza pies. Then in 1958 came Pizza Hut, and the start of the pie’s journey to becoming the nation’s staple food. As of this year, 93 percent of Americans eat pizza at least once a month and pizza is a $40 billion industry. More recently, chain pizza has gone upscale, with many gourmet and artisan pies available from fast-growing quick-serve chains. Now that pizza has left its humble origins behind for gourmet ingredients, what will be the next comfort food item to get the foodie treatment? Quite a few restaurant entrepreneurs are betting on another cheesy dish with equally humble origins to pizza pie: the simple grilled cheese sandwich. Restaurants focused on gourmet grilled cheese are popping up everywhere, leading foodies to wonder if the humble sandwich might be the basis of the next major fast-food trend. While most family restaurants have had a basic grilled cheese on their menu forever, the new development is the emergence of restaurants focused entirely on the simple, gooey entree. They’re taking this treat up a notch with better-quality ingredients and interesting additions besides the usual slice of cheddar. Many restaurants in the gourmet grilled-cheese startup derby across the country, offer their own unique updates and gourmet takes on the lunchtime staple. If your idea of a grilled cheese is a slice of Velveeta on white, watch out — these chains are striving to outdo each other with the fresh produce, organic meats, and whole-grain (or gluten free) breads they offer. As the melt-wars heat up, some chains are using franchising to grow fast, while others are retaining control and opening company-owned restaurants. Click here to read this very interesting article by chicagotribune.com on the increase in U.S. food prices. BREAKFAST FOODS ARE GETTING PRICIER. Bringing home the bacon is costing more, and the same will soon be true about coffee and OJ. Global supply problems are causing surging food prices, and breakfast lovers will likely feel the squeeze. Breakfast is now being served with a side of sticker shock. The price of bacon is surging and the cost of other morning staples, like coffee and orange juice, is set to rise because of global supply problems, from drought in Brazil to disease on U.S. pig farms. And it’s not just the first meal of the day that’s being affected. The cost of meats, fish and eggs led the biggest increase in U.S. food prices in nearly 2 1/2 years last month, according to government data. An index that tracks those foods rose 1.2 percent in February and has climbed 4 percent over the last 12 months. While overall inflation remains low, the increases in food prices are forcing shoppers to search out deals and cut back. Even though food companies use a range of cost-cutting methods to limit the effect of higher food costs, consumers will likely feel the “ripple effects” of rising commodity prices, according to the Grocery Manufacturers Association, a trade organization for more than 300 food, beverage and consumer product companies. Here’s a rundown of why breakfast food costs are rising, and why they could keep going up. Bringing home the bacon is costing more. The price of lean pork in the futures market is at record levels and is up 52 percent since the start of the year, to $1.31 a pound. Traders are concerned about a deadly virus in the U.S. hog population. That could further boost bacon prices, which were already rising after farmers cut pig production because of higher feed costs. Those cost climbed after a drought in 2012. The average price of a pound of sliced bacon in U.S. cities was $5.46 in February, up from $4.83 a year earlier and $3.62 five years ago, government data shows. The retail price of pork is projected to climb by 2.5 percent to 3 percent this year, according to government forecasts. You should expect to see very high prices for your ground beef, your other meat cuts, all the pork cuts will be higher this year. U.S. pig herds have been hit by a virus called porcine epidemic diarrhea, or PED, which causes vomiting and diarrhea in the animals. After the first case in the U.S. was confirmed in May, the virus spread through hog herds during the cold winter. While the disease doesn’t affect people and is not a food safety concern, it can lead to mortality rates of between 80 and 100 percent in newborn piglets. That’s raising concerns of thinner herds as the U.S. heads toward the summer grilling season, when demand typically picks up. Traders don’t know exactly how badly the virus will impact pork production because it’s the first time that PED has been detected in U.S. herds. Most feel that people will cut down in other areas, perhaps spending less at more expensive restaurants, if they feel the squeeze. People still need to get a decent breakfast. You need your morning brew, and you’ll likely pay more for it, at least at the supermarket. Coffee futures have surged 57 percent this year and this month rose above $2 a pound for the first time in two years. Coffee growing regions of southern Brazil, the world’s largest coffee producer, have been hit by drought. Analysts are forecasting that Brazil’s crop could shrink by about 20 percent this year. Whether it’s by the can or the bag, consumers should probably expect to pay 50 cents per pound more, fairly soon. The average price of coffee for U.S. cities was $5 a pound in February, although that was little changed from a month earlier, according to government data. The price impact will be less noticeable at coffee stores. That’s because the cost of beans makes up only a fraction of the final price, compared to other costs like rent and staff wages. Prices should also remain in check because of competition between the companies that roast the beans into the coffee. As for rising commodity prices, that could be speculation. Of course, people who need to get their caffeine fix won’t be put off. Plus, coffee prices were at their lowest level in about seven years before they started climbing. Say squeeze when you pass the OJ. Orange juice futures are up 12 percent this year, and climbed as high as $1.57 a pound March 6, their highest price in two years. To be sure, moves in retail food prices won’t match the wild jumps in commodities markets. The reason: food companies worry about losing market share and will absorb some of the higher costs rather than risk losing customers. People would be up in arms, if every time they went to the grocery store the prices of their preferred items were jumping up and down. The price of a 12-ounce can of frozen orange juice edged up in February to $2.43 from $2.41 in January, according to government data. A series of problems are driving the increases. Florida’s orange crop is forecast to be the worst in almost a quarter of a century. A citrus greening disease, which is transmitted by tiny insects that feed on the leaves of oranges, is damaging the harvest. Infected trees start to produce bitter green fruit. The problem was first detected in the U.S. in September 2005 and the Florida orange juice crop is down by almost a quarter since then. No cure is known, and the only solution is to cut down the tree. Add weather to the orange juice problem. A dry spell last year stunted the growth of orange trees in Florida and is hurting production this year. In South America, drought is raising concerns about the size of the crop in Brazil. There’s a confluence of events … but the citrus greening has probably been the worst problem we’ve seen over the last few years. The orange crop in Florida, one of the world’s biggest orange-growing regions, could fall this year by about 15 percent to 114 million boxes, according to government forecasts. That would be the smallest crop since 1990. Lenten Season Seafood & Fish Menu Ideas. Great menu ideas for Lenten from Saval Foodservice’s Seafood Merchandiser. For additional information see your Saval Sales Representative. MAKING HEALTHY KIDS’ MEALS MORE APPEALING. When it comes to kids’ menus, a lot has changed since the days of chicken nuggets and mac ‘n cheese. Or has it? Chicken fingers are the leading item on QSR and Fast Casual kids’ menus and have grown 19 percent throughout the past three years. Mac ‘n cheese and grilled cheese sandwiches are the second- and third-most popular items, respectively. To be fair, kids are now being offered fruit, string cheese, yogurt and other items in an effort to provide them with better nutrition. Parents are also starting to create more of a demand for healthier options for their children when dining out, although it’s a delicate balance for restaurants to provide indulgence and nutrition during a “treat ourselves” dining occasion. Ironically, the phrase “baby steps” comes to mind when thinking about creating a true revolution in U.S. kids’ menus. Imagine a day when a McDonald’s Happy Meal includes carrot fries or mini tomatoes. Or when the only desserts offered are orange slices, apples and grapes or drinkable yogurts. In the Netherlands and France, this is what you will find in Happy Meals. Kids aren’t so much being “told” it’s healthy and good for them; it’s simply a way of life. We as an industry can continue to chip away at the monumental task of providing so many things in one dining occasion for kids. This is truly a tall order to fill, but if it’s broken down by part, it feels a bit less daunting. Fun & interactive. Going beyond crayons and a place mat, how can restaurants be creative and also cost-conscious in providing entertainment for kids that also makes parents feel good about dining out? A rather inventive idea has been put forward by the people behind www.boomtownbingo.com/smooth-bingo-review, it’s a family bingo game that can be played at the table, with names of fruits and vegetables on the cards. This game, we are told has had spectacular results with the kids. Now, you don’t need to go the whole nine yards like them, it could be as simple as a “20 Questions”-type challenge for whomever wants to join in. Parents appreciate a fun way of entertaining the kids while also educating them about the foods they are eating. Indulgence. After days of spending time trying to get kids to eat their veggies at home, parents are seeking a balance of “responsible indulgence” when dining out. If they are spending the money on a dining occasion away from home, they don’t want their kids complaining about it, nor do they feel like being negotiators with their children in a restaurant. An indulgent menu item that kids don’t typically have at home is a winner for both parents and kids. Flavor & curiosity. Many times these are forgotten words when it comes to kids’ menus, but our little diners are becoming much more food-savvy and curious when it comes to trying new things. This is one reason that there’s been a shift in menu ordering behaviors. According to a survey, 56 percent of parents say their kids’ menu items are ordered off of the kids’ menu at restaurants, while 45 percent usually order from the adult menu. Restaurants have responded to this demand by offering more shareable appetizers and menu selections for families dining out. This will continue to grow as the “snacking” phenomenon asserts itself into our diets. Nutrition. Let’s shift this idea into “balanced:” Balanced in portion sizes, nutritional value, and most importantly, supporting an aggregated diet of American children today. Parents as leaders, combined with restaurants, schools, and groceries can create a better-rounded, balanced diet for children today. We haven’t really started a revolution. Or at least, not yet. And we, for quite some time, likely won’t entice children with orange slices to replace an ice cream sundae for dessert. But what we can do, and should all take responsibility for, is affecting a change in our children’s eating habits. According to the Center for Disease Control, the percentage of children aged 6–11 years in the United States who were obese increased from 7 percent in 1980, to nearly 18 percent in 2010. Just imagine when these next numbers are published for statistics through 2013. Doubtfully they will be much more positive. Kids’ menus. Evolution? Revolution? Our industry must start with one to get to the other. THE MEDITERRANEAN DIET CONTINUES TO DRAW ATTENTION OF HEALTH-CONSCIOUS CONSUMERS. The Mediterranean diet continues to grow in popularity, and restaurants have the opportunity to capitalize on the trend. Although termed a “diet,” it is more an eating style, with an emphasis on healthful high antioxidant-, fiber-rich ingredients such as fresh fruits, vegetables, legumes and whole grains, and healthier fats derived from olive oil, nuts, and seafood. Not only are consumers driven toward this flavorful and freshly prepared cuisine, but growing research on its numerous health benefits has given it precedence in the scientific community, as well. For years, respected health organizations such as the American Diabetes Association and the American Heart Association have supported the Mediterranean diet for its emphasis on incorporating variety into the diet rather than restrictions, and a panel of physicians and nutritionists ranked it this year’s top plant-based diet and third best diet overall in the U.S. News & World Report’s “Best Diets 2014” ranking. The latest research provides additional evidence for supporting this cuisine. Individuals with greater adherence to a Mediterranean-style diet — without making any intentional modifications to their current diet or lifestyle — were found to have significantly less weight gain, lower cholesterol and reduced risk of developing metabolic syndrome. Enhance the natural flavor of dishes through herbs and spices rather than salt. Basil, cilantro, ginger and saffron are just a few accents that can complement any sauce, dressing, marinade, soup or entrée. Boost the use of fruits and vegetables. Bring color and variety to salads and seafood dishes with fresh, seasonal fruits, and add hearty vegetables to chili, soups and noodle dishes. Provide alternative sources of protein. Use proteins such as omega-3 rich salmon, tuna or shrimp, or make substitutions available in place of traditional meats in entrées and salads. Use extra-virgin olive oil in place of butter and highly saturated dressings. Use it to flavor salads and drizzle over vegetables and pastas. It can also be used in low-heat food preparation. Add texture with fiber-rich foods. Infuse texture into dishes by adding fiber-rich beans and legumes into salads and side dishes, and nuts and seeds as toppings. Replace refined grain breads and noodles with whole grains. Use brown rice, quinoa, whole-wheat pasta and wild rice in place of refined grains wherever possible.